Updates on new clients and projects. 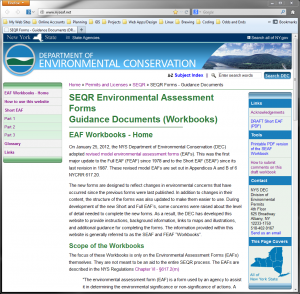 Last year, the NYS Department of Environmental Conservation (DEC) adopted revised model environmental assessment forms (EAFs). This was the first major update to the Full EAF (FEAF) since 1978 and to the Short EAF (SEAF) since its last revision in 1987. During development of the new EAF’s, some concerns were raised about the level of detail needed to complete the new forms. As a result, DEC contracted with Nan Stolzenburg and Don Meltz to develop a set of online workbooks to provide additional guidance for completing them. For local government officials involved with State Environmental Quality Reviews (SEQR) through your municipal board positions, Nan Stolzenburg and Don Meltz will be offering a workshop in March on using the new SEQR forms. 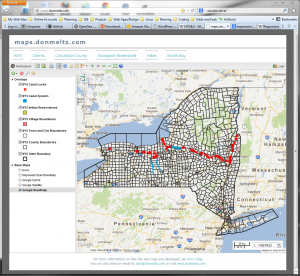 Don will include an overview of GIS resources available to help complete the forms. You can register now on the CLC website. Self-certification forms will be provided for 3.0 credit hours of land-use training for municipal boards. Credit will be awarded at the discretion of each municipality. For more information, contact Ellen Jouret-Epstein at 518.392.5252, ext. 208 or ellen@clctrust.org. The primary goal for doing the redesign was to integrate my various online services as much as possible. Previously I had both a website and a blog, but they were hosted in different places and the design was different for each. The same was true for my map site. I also had a file sharing service that was not connected to any of my other services. All of these were functional, but they did not provide a very cohesive experience for my clients and visitors. So, What’s new, and what’s changed? Other than the look and feel of the website, the biggest change was the merging of my website and blog into the same space. I’ve added a News category to the blog that will be strictly for announcements of new clients, projects, and other business related content. The Blog entries will continue to be about whatever happens to be on my mind at any given moment, or what I happen to be working on at the time. My online map prototype now has its own spot on the website. This page is what I used to call my GeoSandbox. 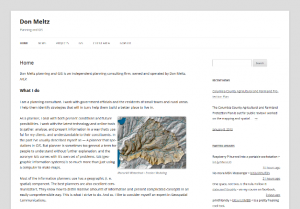 It has now evolved into a working online slippy-map that I’ve used for a few of my clients. It’s an efficient way to share data and analysis results. It is particularly useful for larger regional projects where paper and PDF maps simply cannot provide the level of detail needed at a scale that will fit on a single printed page. It’s also a great way to publish maps that change frequently. It is surprising how much paper gets used on a single project with multiple map drafts. I’m also experimenting with a couple of file sharing options for my clients. Previously, I had been using the DropBox service to post and share files, and it has worked very well. However, there are a few minor limitations I’ve run into. So, I’ve added a spot where my clients can have their own password protected access (Client Area) or open access (Gopher) to the various files that pertain to their projects. This should make it easier for clients to find the documents and maps I’ve produced for them without having to ask me to send them another link or email attachment. All of the pages here use a responsive design, which means it should provide a nice user experience for those using smart phones and tablets to access the website as well as a traditional computer monitor. If you want to test this, try adjusting the browser window to a very narrow size to simulate a phone screen, and see how it reacts. That’s basically what responsive design means. The Wordpress theme I’m using is a modified version of Twenty-twelve. I looked at dozens of other themes, but kept coming back to this one. I finally realized that if I were to build a theme from scratch, Twenty-twelve is probably what I’d want it to wind up being. So there you have it. Feel free to browse around, and let me know what you think. I’m always open to new ideas and constructive criticism. To help guide the sustainability of agriculture on a county-wide basis, the Columbia County Agricultural and Farmland Protection Board (AFPB) has developed a county-wide plan focused on agricultural economic development and farmland protection. The culmination of this two year project is the release of a draft Protection Plan for the county. The complete document, with appendices, can be located on the web at: https://sites.google.com/a/columbiacountyny.com/columbia-county-agriculture-and-farmland-board/plan. Hard copies of the plan are available at County Office Building, 401 State St, Hudson, the Cornell Cooperative Extension Office located at 479 Rte. 66, Hudson, NY and at the Farm Credit office, 190 New York 9H, Claverack. If you cannot make any of the scheduled meetings, your comments are still welcomed. Please contact Mary Ann Johnson at Hudson Valley Agricultural Development Corporation at 518-432-5360 or at majohnson@hvadc.org.